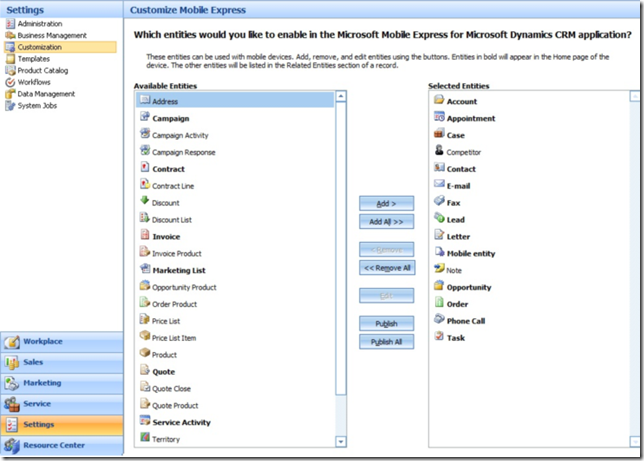 Available Entities – This is the list of entities that can be enabled for Mobile Application. For example, you would not see these entities in Mobile Application until you move them across to the Selected Entities list and publish the changes. Selected Entities – This is the list of entities which are currently selected for Mobile Application. Launching Mobile Application would show you these entities. You will need to publish the entity once it is moved from Available to Selected or vice versa to see the changes on the mobile application (device). 1) What is the landing page of the Mobile Application? Landing page is the first page which users see after they’ve signed in with http://CRM_Server_Name/OrgName/M. This landing page would show you all the entities which are available for Mobile and the ones which have its own home page. 2) In Mobile Console, why are some entities listed in bold text and others not? Not all the entities supported for Mobile has its own home page (i.e. : Mobile Grid, View Selector, Quick Find, Paging etc). The entities which are in bold are the ones which have its own home page So, in order to distinguish these entities we have bold them in Mobile Console. 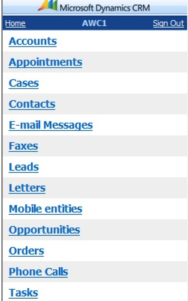 The entities which are not in bold do not have its home page and can only be reached via Related Entities section or by clicking a lookup link from an mobile entity page. Another way of looking at it is that the entities in bold are the ones that are shown on the landing page. 3) My CRM has a base language which is ≠ 1033, why am I not able to use ME? At this moment Mobile Express is only available for US English as a base language. As a result you would not be able to install ME on a system where base language is not US English. 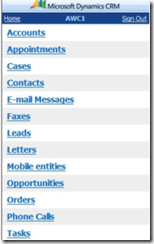 4) How do I navigate to an entity mobile form if it is not listed in landing page? You can do this either via a lookup link in Read Mode or via Related Entity section in Mobile entity page. Till next time, go Mobile!